New Item 6" Back flow Valve. Backwater Valves are designed to prevent backflow in numerous applications where easy service access for maintenance and cleaning is needed. Excellent for use in sanitary or storm sewer drainage systems to prevent waste back up due to inadequate drainage, for balancing multi-level ponds, aquaculture features or storage tank systems, and many other applications. Contains NO METAL, so this is safe for saltwater and reef systems. Backwater Valves have been engineered for improved function and easier service, especially in buried service with use of optional Service-Access Extension available either preassembled with valve or as an add-on kit. Replaceable internal flapper assembly with EPDM Seat. 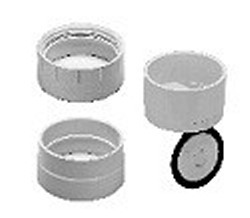 Service-Access Extension available either preassembled with valve, as an add-on kit, or as valve & extension kit components with user supplied pipe. 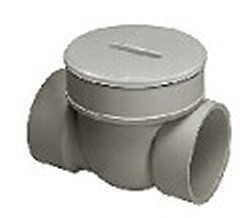 Direct Connection to ASTM D 2665 PVC DWV or other IPS size pipe. Pressure Rated to 43 psi (100 feet of head) @ 73° (23° C). 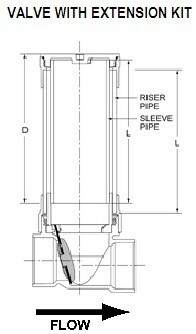 Conforms to ASME/ANSI A112.14.1 for Backwater Valves. Dimensional Specs & Internal View Here. Made in the U.S.A.